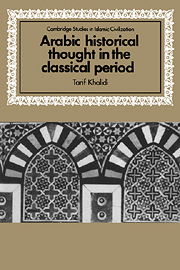 In a work that surveys an entire tradition of historical thought and writing across a span of eight-hundred years, Tarif Khalidi examines how Arabic-Islamic culture of the premodern period viewed the past, how it recorded it, and how it sought to answer the many complex questions associated with the discipline of history. l. The birth of tradition; 2. History and hadith; 3. History and adab; 4. History and hikma; 5. History and siyasa; Conclusion.